Electronic Actuator Tester. The Vane Commander 2 is a full featured electronic actuator tester. It will test and calibrate the following actuators: It works on Cummins smart actuators (as far as I know all of them including calibrating), Borgwarner 6.4 Ford actuator and B2UV actuator, Borgwarner S300V John Deere and International( these are PWM john deere requires additional cable), and Hella for the sprinter van (also pwm and also requires additional cable). It is internet updateable so as new actuators and functions become available you can update your Vane Commander over the internet. 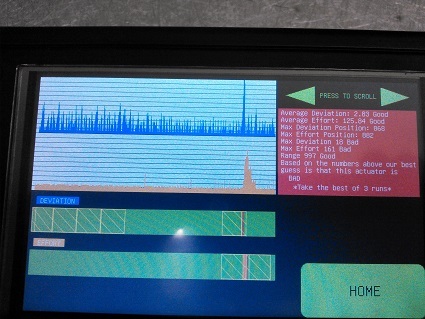 The first test moves the actuator from 0% to 100% to 0% travel and times it. It repeats this for at least 30 seconds after 30 seconds it continues until you press stop. It then looks at the fastest time and the slowest time and makes sure they are within a certain deviation of each other and that the slowest time is within a certain parameter. 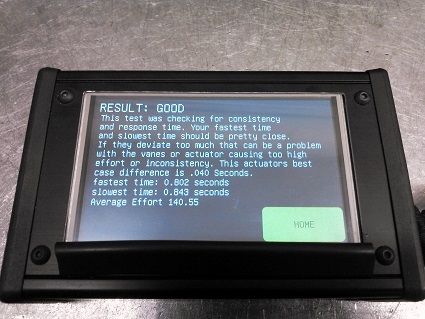 It then displays the results telling you the fastest time, slowest time, the average effort/(calibrated amperage) and GOOD, BAD or QUESTIONABLE depending on what results you got. 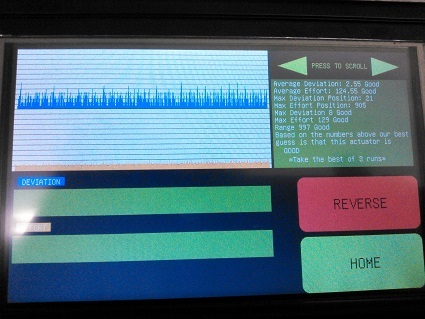 The second test slowly travels from 0% to 100% travel. As its doing this it draws 4 graphs. The top one is the difference of where we are asking it to be vs where its reporting it actually is. The second one is the effort/(calibrated amperage) that the actuator is using. The third graph is a bar each line on this graph represents a position of the actuator and if its green the deviation at that position is good, yellow questionable, red bad. The fourth graph is a bar as well and is just like the third graph except it represents the effort. When it gets done it will give you numeric results such as the maximum range, average deviation, max deviation etc, and many others it will also tell you good, bad or questionable for the result. Just because every individual position tested fine and all the numeric results are good does not mean the actuator passes. After testing it will run the results through an analysis if it judges the deviation is too high for too long or the effort is too high for too long it can still fail if this happens a yellow or red square will be drawn into the third or fourth bar graph letting you know where the problem is. When looking at the results you can scroll through the positions and see the deviation and effort at any position. 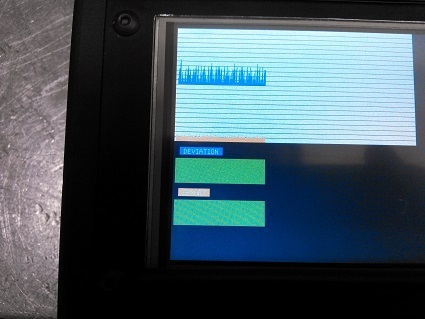 For PWM there is no position feedback so the testing is a bit different. There is a test 1 that works just like the test 1 with can bus. There is also a manual postioning mode that allows you to move the actuator with two arrows. 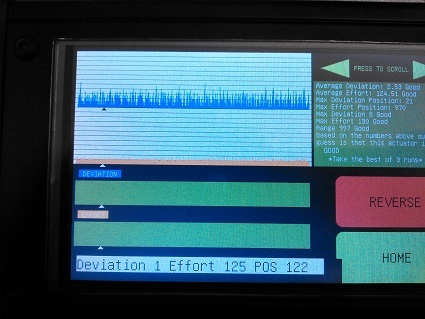 Test 2 moves the actuator from 0->100->0 several times at different speeds, graphing the effort used while doing so. Because of the lack of accurate position sensing it makes it impossible to do the kind of analysis that we do on the can bus for this test so its up to you to determine good or bad. The first picture is what you will see when you first power the machine on. 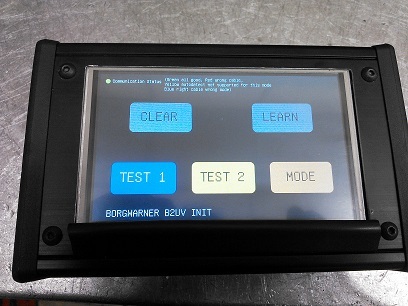 The test are initiated with the touch screen buttons. The circle at the top left tells you if you are in the correct mode/have the correct cable. The fifth shows you results from test2 on an actuator that failed. Notice the text background is red, and the squares and lines drawn in the third and fourth graphs. The last picture shows you an example of scrolling through the results of test2 notice the triangles denoting your position. If you have a Cummins 6.7 and don't want to mess with trying to calibrate or check your actuator you may want to check out our actuator. No calibration required and self checks.